Literacy is our primary focus. We want to create a world where everyone has access to books and the ability to read. If you had a question you want to ask there’s a good chance that it’s been asked and someone on our Little Book of Words team has answered it. Please look through some of the questions that we are frequently asked. If you still have questions about our company or our inspirational books click here and ask away! What is Little Book of Words? What problem does Little Book of Words solve? We create easy to read inspirational books on specific topics. Every Little Book of Words is written by an expert on that topic so the content is always authentic, relevant, and personal to the target audience. Our Buy a Book Give a Book model is a sustainable way to build a great company and make sure that more people have access to inspirational books that in most cases would not. Where did the idea for Little Book of Words come from? Our founder, Chadwick Sapenter, lost nearly everything in the economic crisis of 2008. Having grown up in the foster care system, Chadwick regularly gave motivational speeches to foster children. The children he spoke with were often despondent, thinking that they didn’t have the ability to change their lives. He had a lightbulb moment: The children needed to hear from someone who had been where they were and overcome, in a format that was easy to understand and easy to carry around with them. From that moment the idea for Little Book of Words was born. Our goal now is to create a Little Book of Words on just about every topic with insight and inspiration from people who have lived those experiences. Our core belief is that people would be inspired to read, lives could be impacted, and individuals could be helped by hearing from people who share their experiences and were knowledgeable on the topics that they had an interest in. Check out the Little Book of Words Story Pg. While in foster care our founder Chadwick Sapenter saw children moved in and out of different placements often without notice, and many times all they were able to take with them was what they could fit in a garbage bag or their pocket. He wanted the books to be small enough that if a person was in a hurry or could only grab one thing, they would grab their Little Book of Words because it was small enough to fit in their pocket our logo is a reflection of that philosophy. Although the sizes of pockets vary we use pocket sized to emphasize the portability of our inspirational books. Is Little Book of Words a non-profit company? NO, Little Book of Words is not a non-profit company. 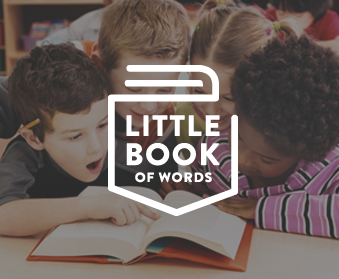 Little Book of Words is a for profit company with giving incorporated into through our Buy a Book, Give a Book model. Does Little Book of Words work with non-profit companies? Yes, to accomplish the GAB (Give a Book) part of our model we have partnered with Book Spring and as we grow we will partner with other organizations to expand the impact we are able to make within the U.S. and across the globe. Does Little Book of Words just sell books? Little Book of Words primarily sales books, in addition to books we offer branded apparel, and jewelry. And with every product we sell we will give an age appropriate book to a child in need. Where can I buy Little Book of Words? At this time you can only purchase Little Book of Words through our online store. In order for us to offer the most value, create high quality books, offer free shipping, give a free digital book when you purchase a physical book, and to have the ability to sustain our Buy a Book Give a Book model we cut out the distribution cost and ship every book from our office directly to your home. Can I create a custom Little Book of Words? If you want customized Little Books of Words for your company or organization fill out this custom Little Book of Words contact form and one of our team members will follow up with you. Are the books you give the same as the Little Book of Words title I purchase? NO, we provide the resources to our community partners so that they can purchase books that fit the needs of the people within the communities we serve. Can I donate to Little Book of Words? How sweet of you, but NO. The best way to help us give more books is to purchase a book or product, that way you get an amazing book for you or as a gift for someone else and a book is given to a child in need. This is great for everybody. Is there really literacy problem? Yes. Literacy is a huge problem. Ok, I know in poor countries, but is there a problem in the U S of A? Just about 1/3 of the population in the United States lacks basic literacy skills. That’s nearly 100 million people that aren’t able to read well enough to fill out a job application, read the side effects on medical prescriptions, or even read to their children. Learn more about Why Reading Matters by clicking here. Yes, we believe so. If we can provide access to books and resources to children and families we can end this crisis. It will be difficult, it will take time, but we are up for it!